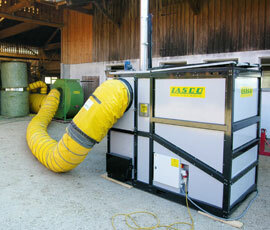 Farmers with a high heat demand in their businesses can still benefit from government subsidy support for biomass. Since its launch in November 2011, the Renewable Heat Incentive (RHI) has only paid out about £20m out of a potential £800m pot to 2,386 projects, said energy consultant Stuart Boyle from South East Wood Fuels. As a result of this significant underspend in RHI funding, farmers with a large heat or hot water demand should seriously consider biomass as a cost-effective, low-carbon alternative to fossil fuel heating, and cash in on the RHI, he said at the Nextgen energy conference in Stoneleigh, Warwickshire. For poultry producers in particular, switching from LPG blown air combustion heaters to indirect hot water heating systems (biomass systems, eligible for the RHI), could result in performance benefits of up to 30p/sq m/week, said Paul Clark, managing director at biomass system installer Rural Energy. Traditional LPG heating systems were not very efficient, producing higher levels of carbon dioxide and making it much more difficult for farmers to control the climate inside poultry sheds, he said. To achieve the full benefit of a biomass system, farmers would have to be prepared to adapt the way they managed their poultry sheds, added Mr Clark, who warned against cost-cutting when buying equipment. “It’s a false economy to go for cheap systems; it’s going to be there for 20 years plus so it needs to be high quality and suit the environment,” said Mr Clark.